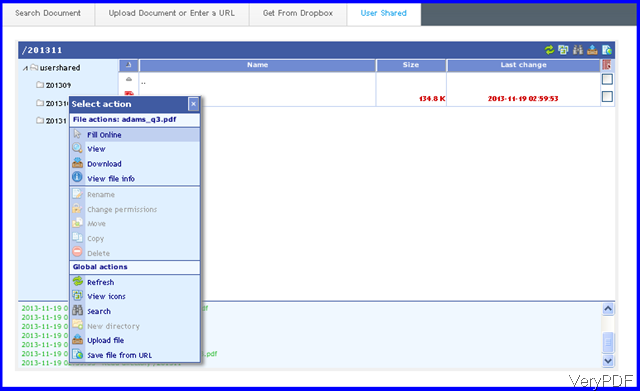 ← How to update table information in a PDF using PHP website? 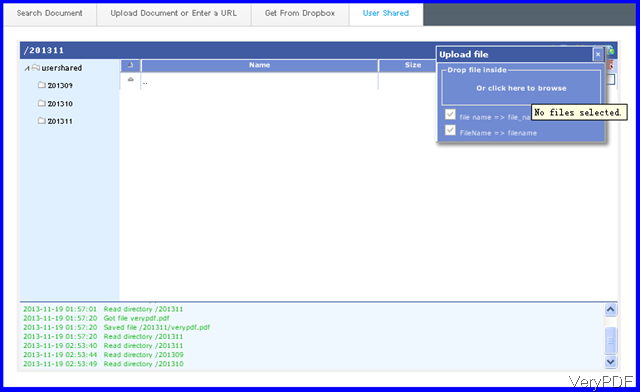 In this article, VeryPDF will share a method of uploading PDF form for users to fill out directly free online. This function is extremely good for some company, bank and others, say company could upload some standard PDF application form for applying job. The appliers could fill out their basic information according to the form. Meanwhile by this method, users do not need to install any third part application as they can fill PDF form directly online quite easily and simply. 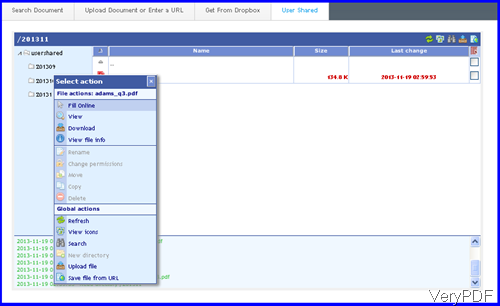 This method should be done under the help of VeryPDF cloud based application VeryPDF PDF Form Filler by which we can also search other kinds of PDF form like W8, W9 and then directly fill them online. By the searching function of this API, you can find various of PDF eBooks which allow you to view, download, print and add comment directly. Please check more information of this software on homepage, in the following part, I will show you how to use this software. Step 1. Upload local PDF form. Please go to website of PDF Form Filler and then go to tab of User Shared which looks like the following snapshot. Please click left date of round those three months to choose uploaded folder which is good for showing update date. In the right top corner there are five little icon, please click the second one counting from right to upload local PDF form. After clicking it then you will see option like I showed above where allows you to browse folder containing PDF form. When uploading finishes, the uploaded PDF form will be shown on website with detail information like PDF size, updated date. Step 2. Fill PDF Form directly online. When upload PDF form then you will tab like the following snapshot. Uploaded PDF form will be listed there. You can simply right click the upload PDF form and then there will be dropdown list which allows you to choose options, say here you can fill online directly, view, download PDF form, view PDF form basic information, sign PDF and others. When you need to users to use those function. Simply click icon of searching, which is in the middle of those icons. You can tell user what the name is of the upload PDF form. After users input the name in the search blank then they will see the same result as when you upload. By the same method, the user could fill PDF form directly online here. By this function of this API, you can upload PDF form and fill PDF form easily and totally free. During the using, if you have any question, please contact us as soon as possible. This entry was posted in VeryPDF Cloud API and tagged fill PDF form, upload PDF form. Bookmark the permalink.